NFSMods - Ed - The Car Dealer! Ed - The Car Dealer! Ed is a tool which makes adding cars easier for your favorite racing game!
! Please don't ask support for other games. They may or may not be added over time. - ProStreet & Undercover = Add-on cars work perfectly fine.
! Don't use more than one mod at the same time for a specific game. Only use the one which works better for you. The tool is pretty straightforward and it's made for last user. So, anyone who knows English can easily use it. Config\<Game Name>: The folder used to store .ini config files. Copy your config files here. Resources\<Game Name>\FrontEnd\FrontEndTextures\<Folder Name with TPK Hash>: Textures folder for FrontA.bun/FrontB.lzc. Copy the textures (CARSELECT_MANUFACTURER_x and SECONDARY_LOGO_x) you want to add into FrontA.bun/FrontB.lzc here. Temp\<Game Name>: Temporary folder which will get created when Ed is working. Use Keep Temporary Files option to prevent Ed from deleting them.
! It's not suggested to make changes on other files in these folders unless you're a professional.
! Before installation, make sure that you have installed .NET Framework 4.5 or higher. 1) Copy the files anywhere on your PC. 2) Run "Ed.exe" as administrator. 3) Press Ctrl+O or click Main > Open to select your game installation directory. Brotip: It's usually in C:\Program Files (x86)\Electronic Arts or C:\Program Files (x86)\EA GAMES. 4) If the game is detected, you will see the folder path under the Config List view. 5) Config files for the game will be listed on the screen. If you don't see any, press Ctrl+B or click Main > Browse Config Folder... to copy them in. Then, press F5 to refresh the view. Brotip: Also see the Example Config File.ini. 6) Now press Alt+A, click "Apply" button or click Tools > Apply the Changes in Config File(s). 7) Ed now should do everything required to add the cars you want. 8) If the "New cars added successfully." dialog appears, it means that Ed completed his job. 10) Run the game, create a new save game and enjoy your new car! MORE IMPORTANT: It's suggested to use Tools > Unlock Game Files For Modding if it's your first time to mod your game, or if you have any issues. 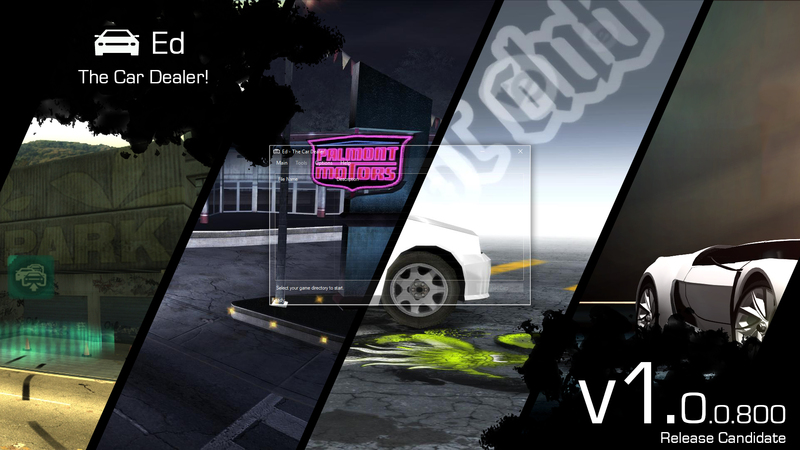 + Added Need for Speed: ProStreet and Undercover support! + Added new options under "Browse Resources Folder..." to open bounds (collision) and texture folders directly. * Changed game detection method. * The tool now asks if you want to download NFSMW/C Unlimiter or run the game after applying changes. * Made some minor fixes and improvements. * Worked around weird font issue. + Added a setting to prevent Ed from auto-restoring GlobalB.lzc before operation. + Settings now get saved between sessions. + Added Russian language files into resources. * Improved Need for Speed: Most Wanted (2005) support. * Fixed an issue which happens when the last config file belongs to an existing car. * Fixed an issue when user tries to make changes on an existing car. * Fixed an issue which causes duplicate entries in Car Part Info. * Fixed an issue with comments (text after //) in config files. * Fixed an issue when user tries to copy an existing collision for a car with the same xname. * Fixed an issue with Car Part Info when users try to add more than 1 car. * Fixed an issue with Car Info Array when users try to add more than 1 car. * Fixed an issue which makes added textures invisible. - ArturoPlayerOne and 379Felipe for their successful attempts on adding cars. - MWInside for ReCompiler, resources and inspiration. - 379Felipe for testing, resources and tutorials. - heyitsleo for resources and their great help. - Improvement Mod Team (379Felipe, GXP-10, Neon, RaTT, sparx, SpeedyHeart and Xanvier) for their great help. @nlgzrgn Thanks for the update! But i have problem with modified FrontA.BUN file. NFS-TexEd crashes when i try to open file. Any solution? @VrunoBeine123, it may happen if your files were modded before. Please revert back to vanilla ones and try again. I just installed a car, and now my game doesn't open anymore, what should i do?